Harter Fell sits between three valleys - Kentmere, Longsleddale and Mardale. Its best feature is Small Water, one of the most attractive of the district's tarns, but the views from the top are also impressive. Harter Fell is in the shape of a horseshoe, open to the south east. Wren Gill rises on the gentle slopes inside the horseshoe and flows past abandoned quarries into Longsleddale, where it joins the River Spring. The summit is at the head of the horseshoe. The northern arm ends at Adam Seat, overlooking Gatescarth Pass. The southern arm links to the ridge between Kentmere and Longsleddale, which continues south at a high altitude for another mile and a half. The most impressive parts of the fell face towards Mardale. Here there are the northern crags, which loom over the remaining part of Mardale Head, while an interesting rocky spur runs north-west towards the top of Nan Bield Pass. The car park at Mardale Head is annoyingly small, almost as if it was designed to put off visitors! Harter Fell is often visited as part of the Kentmere Round, a long but impressive walk that can cover nine summits (if one diverts to High Street and includes Shipman Knotts). From the south the fell can be reached from the pass that connects Sadgill in Longsleddale with Kentmere. At the top of the pass a path heads up to Shipman Knotts, then Kentmere Pike and finally to Harter Fell. The eastern slopes of the fell are more gentle. From Mardale these slopes can be reached along Gatescarth Pass. This route could also be taken from Longsleddale, but it would also be possible to follow Wren Gill into the middle of gentle eastern slopes. We visit Harter Fell on the Kentmere Round. This isn't one of the better summits - a large grassy plateau is split by an old fence, with a path alongside the fence. The area can be quite wet, but I did enjoy the walk south from here. The view of Ill Bell and Yoke across Kentmere is very impressive. To the north Harter Fell is bordered by Small Water Beck, which flows out of Small Water and heads towards Haweswater. Before reaching the lake it merges with Blea Water Beck and becomes Mardale Beck. To the north-east the border is formed by Gatescarth Beck, which flows north-west from Gatescarth Pass into Haweswater. On the first side of the pass we find the source of the River Sprint, which forms the eastern boundary. The boundary with Kentmere Pike is formed by a nameless beck that flows east before merging with Wren Gill, which rises to the east of the summit of Harter Fell. Wren Gill then forms the boundary, before joining the Sprint. On the Kentmere side of the fell the northern part of the boundary is formed by Lingmell Gill, which flows south from just below Nan Bield Pass into Kentmere Reservoir. Below the reservoir the border is formed by the River Kent, which flows south then east around a spur of the fell. On the other side this spur is separated from Kentmere Pike by Ullstone Gill, which flows down its own small valley before joining the river. Plenty of small becks are formed entirely on the fell, but only Wren Gill gets its own name. Harter Fell can claim a half-share in the very pretty Small Water, which sits in a impressive craggy bowl in the hills below Nan Bield pass. 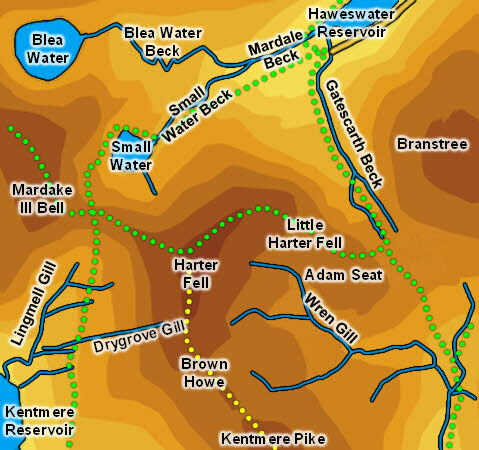 The fell can also claim half of the Kentmere Reservoir. Harter Fell was once passed by two passes between Mardale and the surrounding valleys - Nan Bield Pass going to Kentmere and Gatescarth Pass heading into Longsleddale. Sadly since the destruction of Mardale both of these passes are much quieter than they used to be, although are still passable. The eastern flanks of Harter Fell are the right place to try and see the Lake District's sole Golden Eagle, sadly lacking a mate for the last few years.